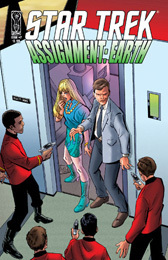 The 1968 TV episode "Assignment Earth" had been the Season Two finale for the original Star Trek series, and was intended by Gene Roddenberry to act as the pilot for a spin-off show, one that never came to pass. 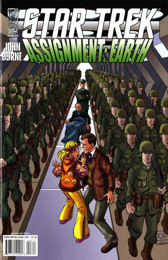 Now, more than 40 years later, John Byrne gets the green light to launch the series. Interstellar agent Gary Seven and his assistant covertly confront threats to the past so that they can save Star Trek’s future. 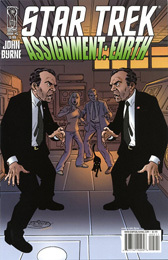 Byrne writes and draws the series, which steps one year forward with each installment, beginning with 1968, the year that the spin-off series would have appeared. Issue 1 - "Brighter Than a Thousand Suns"
IDW's Star Trek: Second Stage continues, as comics icon John Byrne unveils the first-ever Star Trek series of his decades-spanning career! The 1968 TV episode Assignment: Earth had been the Season Two finale for the original Star Trek series, and was intended by Gene Roddenberry as the pilot for a spin-off series that never came to pass. 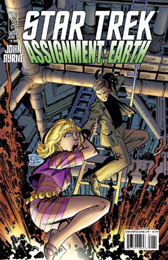 Now, Byrne delivers the series 40 years after it would have debuted, recounting the adventures of interstellar agent Gary Seven and his Earth-born assistant as they covertly confront threats to the past so that they can save Star Trek's future. 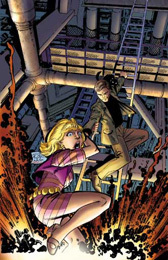 Byrne will both write and draw the series, which steps one year forward with each installment, beginning with 1968, the year that the spin-off series would have appeared. 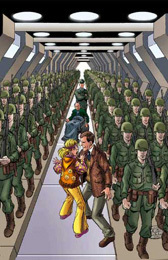 Issue 2 - "Yesterday, Today and Tomorrow"
Issue 3 - "My Name is Legion"
Crisis on campus! The time: 1970. The place: Earth. The situation: Critical! Comic book legend John Byrne continues his first-ever Star Trek miniseries, featuring the enigmatic interstellar spy Gary Seven and his intrepid assistant, Roberta. 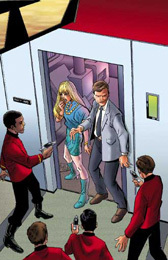 Following their encounter with Kirk and the Enterprise crew, the duo must go undercover in the Halls of Ivy as students burn their draft cards and National Guard troops patrol the quad. What is the terrible truth behind rumors of an army of super-soldiers - whose purpose may be much more sinsister than fighting in the jungles of Southeast Asia? 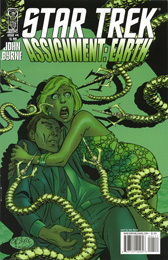 Issue 4 - "We Have Met The Enemy…"
Mysterious alien technology. Senseless death. And a growing awareness that there may be those beyond our world who don't want to see Earth survive! Seven and Roberta face their greatest challenge yet… an invasion from the most distant regions of the Galaxy! Issue 5 - "Too Many Presidents"
The President of the United States is the most powerful person on the planet — but what if the man in the office is an agent of a foreign government? Seven and Roberta journey to Beijing to make sure only Nixon returns from China! Byrne's first-ever Star Trek series concludes here!